Incorporated 1879 (Ont.) Acquired by foreclosure by Canadian General Electric in 1897. Sold July 1902 to GVRyCo interests, and merged into that company 1907. (OPM, Dorman, CYB 1905-1911, Mills 1977). Also an interurban operation, acquired by the City of Brantford 05 August 1914. 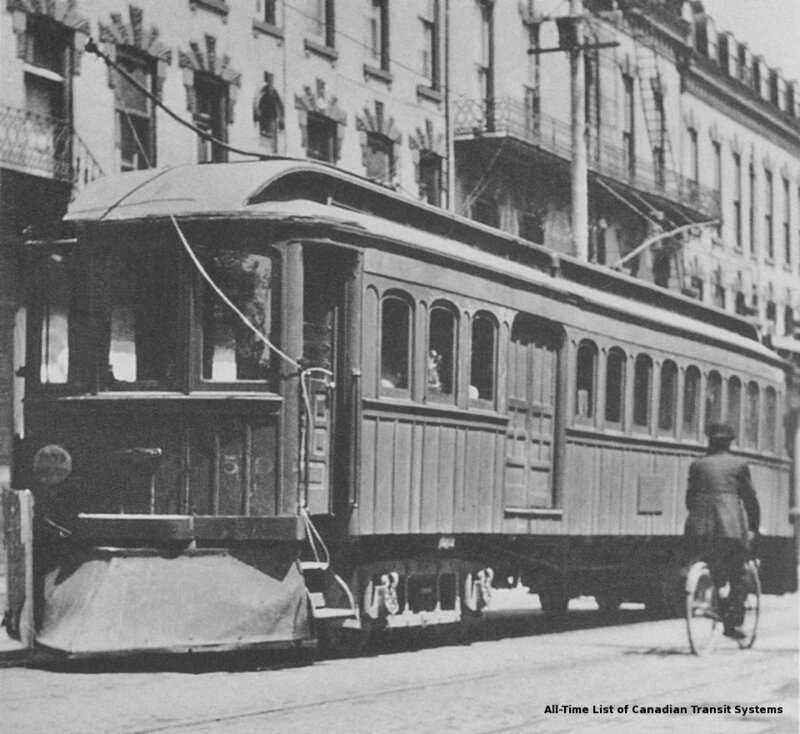 Interurban operations were subsequently either abandoned or sold. Retained the Brantford - Paris suburban route after the Grand Valley closure. Introduced bus service for Terrace Hill neighbourhood in 1916. Transferred bus to West Brantford route 1917. Bus service ended 1923 and buses disposed of in 1924. (CYB 1915-1940, Mills 1977). Subsidiary of Highway King Coach Lines. Trial period replacement of street railway service. Electric streetcars discontinued 1940. 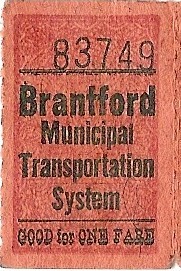 Ticket lettered Brantford Municipal Transportation System. ( Canadian Coach Vol. 9, No. 3, May/June 1973 says PUC startup was 01 February 1940). (Photo: Bernard Drouillard [Peter Cox collection]). * Date is from OPM (and Mills 1977). ** CR&MW December 1932 reported that BMRy bus service commenced 01 July 1930. § Suburban bus service between Brantford and Paris, operated by the BMRy, commenced 15 June 1929 (RFC). Incorporated as the Port Dover, Brantford, Berlin and Goderich Railway Company 1900 (Dom.). Name changed to GVRyCo 1902. Service from Brantford via Paris to Galt. The Grand Valley absorbed the Brantford Street Railway Company 1907 (which it controlled from 1902) and eventually was acquired by the City of Brantford 19 December 1914 seeking to preserve the city system and to dispose of the rest. 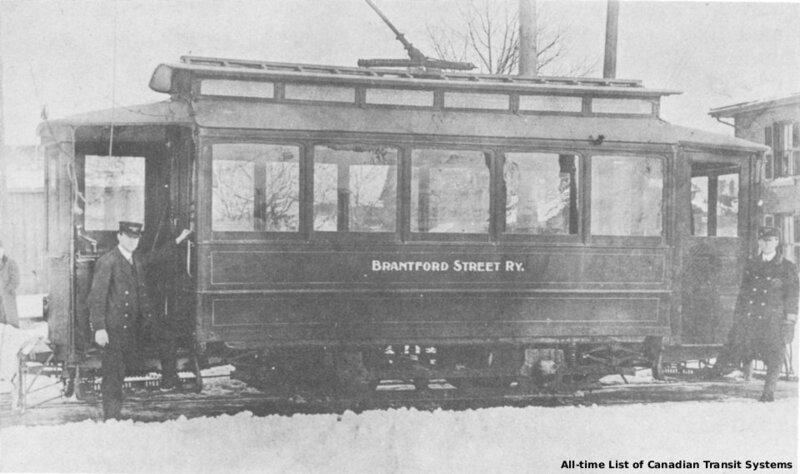 Most of the interurban operation was abandoned in 1916 but one suburban segment (Brantford to Paris) continued under Brantford Municipal Railway operation until 15 June 1929 (Mills 1977). For 1903-1916 see Grand Valley Interurban. For 1916-1996 see Brantford. After discontinuation of Brantford Transit service to Paris, several other operators have provided transit service between the two communities. Gave up the Brantford - Paris service “four years ago” (Brant County Transportation Master Plan, December 2008). Also known as Paris Taxi. Cut service from six trips per day to two in August 2007. ( Paris Star 06 September 2007). Eight trips per day. (cptdb 2010, website 2010). Website did not exist October 2015. Engineering Department - Transit History , a City of Brantford world wide web page at the url: http://www.city.brantford.on.ca/engineering/about.htm, 1998. OPM - Unpublished data and records from Orin P. Maus of Brantford, Ontario. Provided by Ray F. Corley of Scarborough, Ontario, 1996. 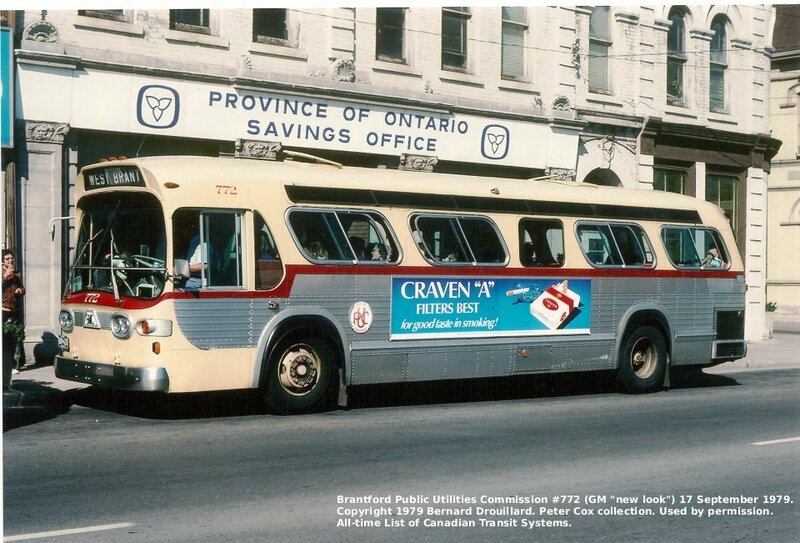 Métis Transit Ltd., Brantford Transit History , a world wide web site at the URL: http://www.metistransit.on.ca/history/bran1.htm 2003-2005. Parberry, Darren, GTA (Greater Toronto Area) Transit Information - Brantford Transit - History , a world wide web page at the URL: http://gtatransit.freehosting.net/bran1.htm 2000. Copyright ©1989-2015 David A. Wyatt. All Rights Reserved.